Life insurance policies in Boca Raton, Florida. 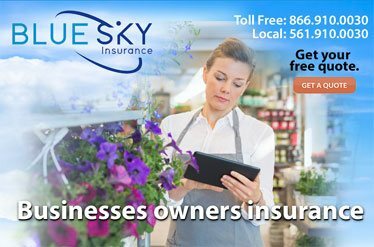 with quality individual life insurance policies from the best carriers in the industry. Life insurance policies for both parents can help ensure a secure financial future for your family members. If one parent were to die, life insurance benefits could be used to help replace that spouse's income, pay off debts, cover living expenses for the family or pay for your child's eventual college expenses. 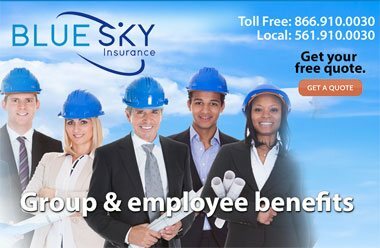 That's why at Blue Sky Insurance we recommend a life insurance policies that are right for your financial projections. We get multiple quotes from our appointed insurance carriers and present to you a plan tailor made for protecting the financial future of your loved ones. Every family's insurance needs are unique and can't always be accurately determined by a set formula like "eight to 10 times your annual income," according to Kiplinger. If I passed away, who would help pay off my mortgage so my surviving spouse wouldn't have to worry about housing expenses? What other debts (car loans, lines of credit, etc.) 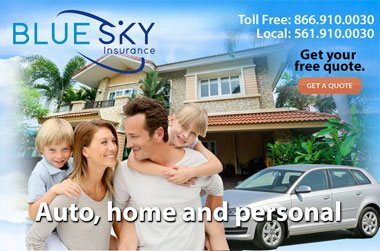 could life insurance help pay off to make my family's living situation more secure if I were gone? Could I use life insurance benefits to cover my child's college expenses if I passed away? Would I need life insurance to cover all my family's living expenses if I died, or could my surviving spouse work to help cover costs? These are some hard questions you have to answer. The cost is lower than most people anticipate too, especially if you are under 55. We can tailor specific policies and other investment tools to make sure you have better financial security as you grow older. Florida residents have the following life insurance policies to choose from. These Florida life insurance policies are typically what you can get anywhere in the country. 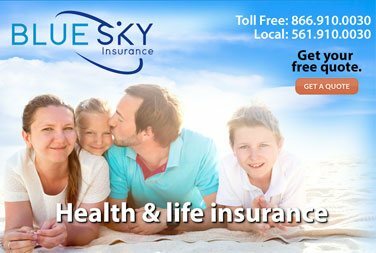 Blue Sky Life Insurance agency in Boca Raton will work with you to tailor your policy to your family’s objectives and goals. Learn how our life insurance agents work with you to get life insurance quotes that are priced low with excellent coverage. Whole Life Insurance: The nice thing about Whole Life is you can choose the duration of your premium payments depending on what you want to spend a month to pay off the policy You can also take a loan out on the policy but need to pay it back or it will be deducted from your benefit. • Guaranteed growth of cash value via investment. Universal Life Insurance: The advantage with Universal Life is you can adjust your payments, miss some payments as long as you meet a minimum overall annual and you can adjust the benefits as your you see fit. Variable life Insurance: Variable lets you invest your cash value and benefit into investments and use the profits to pay premiums or add to your benefit payout. Variable Universal Life: This combines the above two types of policies into a very complex and flexible policy. Talk to your agent about the disadvantages and advantages to this plan. • Combines investment features of variable life with the flexibility of universal life. Survivorship Life Insurance: The good news with this insurance policy is that it is cheaper than two policies but the benefits only go to the heirs. This should always be accompanied by other policies to ensure the financial stability of the spouse. • Covers both spouses and pays out when second person is deceased. Annual renewable term: For younger people who want to start of with a very low premium. Level premium term: This premium costs more but it stays the same for the life of the policy.